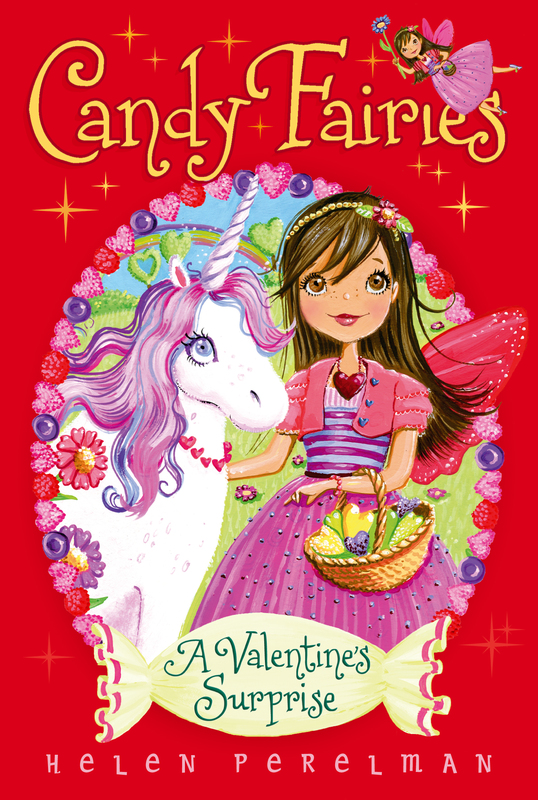 The Candy Fairies have a mystery to solve in this new addition to a deliciously sweet series. Raina wants to make a very special birthday treat for Berry. She's even asked Lyra, the unicorn who looks after the Fruit Chew Meadow, to grow a special flower for the surprise. But when Raina and Dash go to visit Lyra, they are in for a sour shock! All the flowers in the meadow arewilting and Lyra's sick! Her horn is dull and she can't stand up. Something--or someone--is hurting the gentle unicorn and the meadow, but who? And what about Berry's birthday? All the Candy Fairies will have to work together if they are to solve this mystery, cure the meadow and Lyra, and make sure that Berry has the sweetest birthday ever! Raina the Gummy Fairy sprinkled handfuls of colorful flavor flakes into Gummy Lake. She smiled as the gummy fish swam over and gobbled up the food. Watching the fish eat made Raina’s tummy rumble. She had gotten up very early and had been working in Gummy Forest all morning. When she settled on a perch high up on a gummy tree, Raina opened her backpack. All the animals in the forest were fed, and now she could relax and eat her own lunch. Raina had an important job in Sugar Valley. She took care of the gummy animals that lived in Gummy Forest. There were many types of gummy animals, from friendly bear cubs to playful bunnies. Raina was fair and kind to each of the animals—and they all loved her. “Hi, Raina!” a voice called out. Raina looked up to see Dash, a Mint Fairy, flying in circles above her head. The small, sweet fairy glided down to see her. Raina was always willing to help out any of her friends. She had a heart that was pure sugar. “What’s going on?” she asked.